Ideally suited for rich, full bodied red wines with exceptional flavour complexity. Noted for exceptional depth and flavour complexity, R56 exhibits complex aromatics during fermentation conferring an old world quality which one might only expect from natural flora multiple strain fermentations. Unusually for complex aromatic strains, R56 still respects the varietal character of the fruit and confers good structure and balance. R56 is also a high glycerol producing strain. 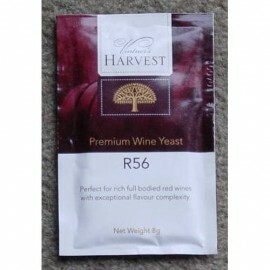 R56 is a medium rate fermenter with optimal temperature between 22 to 30oC (72 -86oF) which will ferment to 13.5% abv. ethanol. Suitable with: Blackberry, Elderberry, Blueberry, Merlot, Malbec, Nebbiolo.